Serenity Now: A Virtual Gold-Mine of Recipes! If any of you read blogs on Saturdays, then you're in for a treat today. 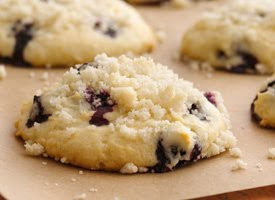 Pillsbury sends me emails every so often, and they are jam packed with tummy tempting recipes, some of which might even satisfy my finicky dear husband. Apparently, they just finalized their top 100 Bake-Off recipes. That 100 people can come up with new, never-seen-before recipes that impressed a large company blows my mind. Creativity in the kitchen doesn't always come easily to me. If you read the guest post on Meal Planning from yesterday, you know that one of my new goals is to start planing ahead for the week. I have Pillsbury to thank for giving me a leg up in my mission to begin Meal Planning. Their newest Top 100 is sure to have some crowd pleasers. I have a link for you here today! 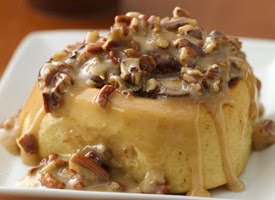 You can click here to see the finalists and to find some delicious Pillsbury recipes to plan your own family's meals. (Note: I found it easier to keep track of things by looking at the recipe titles alphabetically, from A to Z, as opposed to reading by last name or city.) You can also visit Pillsbury's site to get weekly recipe emails. Some of my current faves? Note: I am not affiliated with Pillsbury. The links provided today were just because. Oh. em. gee. Every one of those look amazing! Have you tried anything yet? I just love the recipes on commercial sites, especially since I'm not one of those fantastic dessert bakers. I read your post yesterday and I was thinking about it while I walked aimlessly back and forth at the meat counter today! Yum, yum and yum is all I have to say about that....though my waist line probably has other words in mind LOL. Happy New Year, dear sweet friend. You had me at muffin tops! The cinnamon rolls looks awesome! Thanks for stopping by. Thanks for the link to these prize winning recipes. I'm always looking for something new to try. You'll have to let us know if you make anything from that site. Java Glazed Cinnamon Rolls? I'm in, sistah! 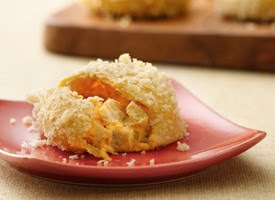 Ooh, the buffalo chicken crescent puff looks divine! I LOVE finding new recipes...thanks for sharing! !